Wright’s signature integration with nature appeared everywhere. Taliesin hugs the landscape along horizontal lines, mimicking the surrounding plains and looming mountain peaks. Fallingwater, meanwhile, hugs it vertically as an extension of a cliff side. In both properties, minimalist red metal brackets support large windows that draw the outside in. We’re told, however, that Wright’s original design for Taliesin included no window coverings at all and that the glass was added latter. Ceilings at Taliesin consist of mere canvas that not only allow light to naturally filter into the residence but also give the vague impression of a more rustic desert camp dwelling. 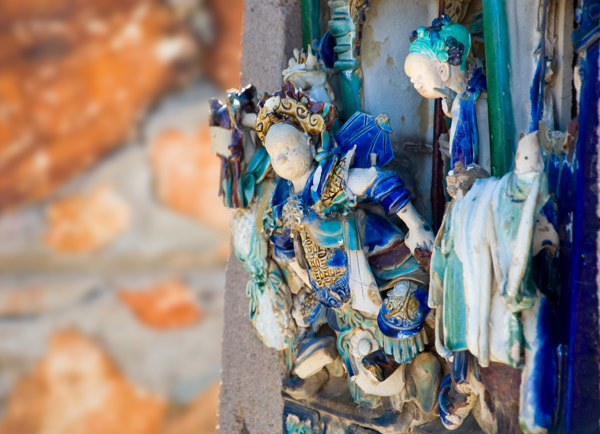 Features of both properties also reflect Wright’s love for Asian art and décor. 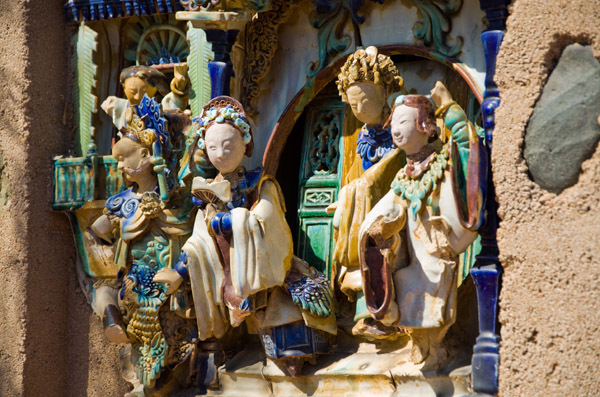 At Taliesin, Beijing ceramic ceiling tiles greet visitors at every entrance. 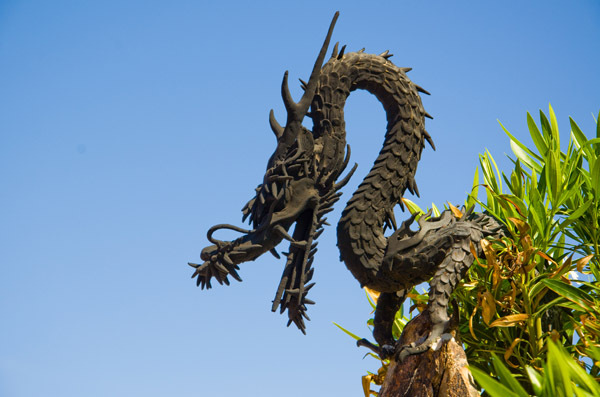 The residence even comes complete with its own fire breathing dragon. Taliesin West was Wright’s winter home and obviously reflects so much of his personality. His love of nature and interest in harmonious architecture is apparent everywhere. Wright long ago said that “a building is not just a place to be; it is a way to be,” and you can kind of feel that here. I doubt the architect would approve of our house on wheels, although I can’t know for certain. But more than a place to be, it is a way of life; one that affords us the opportunity to explore nature as well as Wright’s wonderful creations, wherever they may be. And that is something of which I am certain he would approve. Thank you for this post! We live in Oak Park, and are surrounded by Mr. Wright’s work and legacy. Last summer we toured Taliesin in Spring Green, Wisconsin which is very special — I’d love to see T-West. We missed Taliesin when we went through Wisconsin last year. Looking forward to getting out there at some point. I’ll have to add this to the list when we’re in AZ this winter. Shouldn’t you be high in the mountains by now, escaping the heat? CO is on fire right now….figuratively and literally. We’re heading to Wildflower Festival in Crested Butte, July 9th for some cooler temps. The blog lags behind our travels a bit, so we’re not still in AZ. (Our Facebook page http://www.facebook.com/EverywhereOnce is updated with our current location). Not that it matters much, because it’s 100 degrees where we are in CO and looks to be 105 at our next stop in Moab, UT. Didn’t realize this part of the country got so hot so soon or we’d have gotten through here earlier. FYI….The Monument in GJ and Moab = rock = hot. Try and stay cool…..there’s always Flaming Gorge. Hi Ingrid, we’ve noticed how hot it is in this part of the world. The nice thing, though, is that nights and mornings are still pretty cool. I’m wearing a fleece today at 7:00 AM but it will be over 100 by this afternoon. So we’re planning to get out and do our sightseeing and hiking early before retreating back to the AC. Been meaning to visit here every winter while I’m in Yarnell. 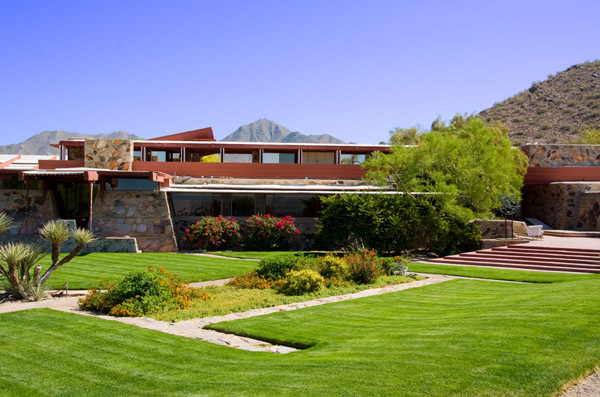 Been to Fallingwater, Guggenheim, Taliesin (Wisconsin), Robie House and Oak Park (Chicago), but not to Taliesin West, so enjoyed reading this article and looking at the photos. As for what Wright would have thought of a mobile home, I’d think he would’ve approved the dimensions of it (he built everything to his trim scale of 5’6?”) and of course he was a huge fan of built-in furniture, and the notion of narrow entryways opening up to a larger space, long horizontal lines, concept often overwhelmingly burdening practicalities – these would have had their appeal to him. He was not beyond designing a mile-high skyscraper, so I can see him collaborating with Winnebago on a Wright edition of the RV – in earthtones with wine-red trim, of course. Very funny, and probably true – especially the “concept often overwhelming burdening practicalities” part – how well that applies to both RVing and every Wright structure I’ve seen.